12 posts categorized "Fashion Technology"
My friend Alison of Switch made this lighted wedding dress for her friend Julia's beachy wedding in Hawaii. I love how this feels like a true wedding dress of the future. After all, we are weeks away from 2010, no? It was decided that the dress should honor the metallic look but with a vintage inspired style. To do this, I focused on creating a soft and glowing design that played with the Victorian shape of the dress. The lighting design was intended to be simple with warm and cool whites. There were no flashing bulbs or severe bright spots. The spectacle of a lighted dress is enough on its own, There was no need to over do it with intense changing colors or a blinding reflection. Alison even made this Luminex shawl for Julia to wear for the beach bonfire. See more beautiful photos of the dress in twirling action at Switch. 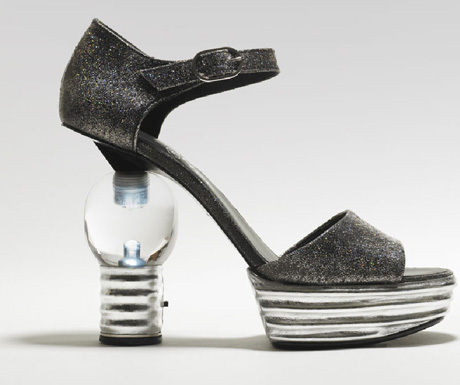 You'll never been in the dark with these Chanel Light Bulb Heels, sequined goat skin sandals with a light bulb that actually works! Of course, this luxe flashlight for your feet will also cost you around $2,200. The design brings together sophisticated style with techy design. The shoes are a part of the Chanel Pre-Fall 2008 collection (via Style.com) and you can see them on the model here as she comes down the runway. Unfortunately, I can't seem to find a photo or runway video of them lighting up as she walks.